The wind was voracious along the ridgeline to the west of the shelter all night. At times it seemed as if a hurricane was making landfall on Jacks Mountain. It was tough to get much sleep and pale sunlight soon returned through the naked birch forest. It was cold and flurries drifted through the air. Gray, cold clouds sped over the mountain. Despite the weather and my aches, we all had something to look forward too- a pizza shop in Three Springs known as Pizza Star 2. I felt stiff and rigid. It seemed to be tougher to move around. The mileage was catching up to me. I dayhike a lot, and tackle some tough trails and bushwhacks. I do not backpack nearly as much and I wasn’t conditioned for multiple twenty plus mile days. I knew I could finish the trail, but it would be on its terms. Today the trail began to change, with more roadwalking as it left Jacks Mountain, crossed a valley, and followed Blacklog Mountain. We were getting closer to Cowans Gap. The trail left the shelter and followed a game commission road, it then left the road and followed a rocky ridgeline to Hoopers Gap. A descent along a grade followed into this glen that harbored a small stream. Flurries continued to drift down. I climbed out the glen along another grade, and at the top, the trail followed the rocky streambed. The trail reached a grassy game commission road, and then a gravel game commission road, which it followed down to SR 2022 and Three Springs. The descent along the gravel road was long and pick-up trucks with hunters would occasionally drive by. There were some views to the south, with shafts of sunlight barely piercing the clouds. From where I was I could see Blacklog Mountain. It was hard to believe I would be there later in the day, all by walking. I reached the road and turned towards Three Springs, a small, tidy town. I passed people’s houses and I’d wonder who they were, or what they did. Being on the trail sometimes makes you think strange things. Take “Welcome” mats, for example. Everyone has one, but do they really mean it? If I just knocked on someone’s door, would I be welcomed, or treated with suspicion and skepticism? We might like to think we live open and welcoming lives, but in reality it is for a select few. Our lives are in a cocoon, they are insulated. And the beauty of the trail is it can strip that away. I entered Three Springs and even began to sing to myself in anticipation of pizza. Google reviews gave the place high marks. But it could’ve been ketchup on cardboard and I’d probably eat it. I’d hum, “Pizza Star 2, Pizza Star 2, me and you and Pizza Star 2…” When that became boring, I moved up a number. “Pizza Star 3, Pizza Star 3, you and me and Pizza Star 3…” I couldn’t find a rhyme for Pizza Star 1. I met Kevin and Amanda at the restaurant and ordered, our packs on the floor. I went into the bathroom to wash. It was odd to have running water and soap. I washed my face and head. My eyes stung from the sweat and salt of almost three days on the trail. The waitress was friendly and seemed happy to have hikers, she said she sees them every once in a while. The food was very good and my “medium” stromboli was the size of a small canoe. I took half of it with me, armored in tin foil. I would end up carrying part of it with me for almost 30 miles. We finished eating, put on our packs and said goodbye. The roadwalk across the valley was before us. The walk across the valley to Meadow Gap was about five miles. It was a fairly pleasant roadwalk over hills and along farms. A stream gurgled along the road. Near the end was a peeling, abandoned farmhouse with fine woodwork and several faded red barns along fields. A monstrous, warted tree, with a gaping hole torn in its trunk, stood guard. Some cedars provided the only green. The memories and years were draining from this place. It belonged in an Andrew Wyeth painting. I crossed scenic Aughwhick Creek and was soon back in the game lands. A long switchback took the trail into the woods and slowly up the mountain. I then noticed two dogs in the woods, one came up to me. The other was a bushy dog that kind of looked like Lassie. I thought they were lost, although they didn’t seem too concerned. A man in an orange hat soon followed and I said hello. I continued along the trail. As I walked I heard something behind me. It was the Lassie dog. It followed me intently. The man and the other dog were no where to be seen. I tried to get the dog to turn around, but it wasn’t interested. It continued to follow me, almost obediently. I let it sniff me and I pet it a little. I happened to stand aside, and the Lassie dog bolted past me and ran up the trail, disappearing in the woods. I never saw it again. I guess the Lassie dog just wanted to get by and I was holding it up. I reached the ridge of Blacklog Mountain and the trail followed a rock-free grade for several miles. It was a nice change. The trail kept off the ridge, staying on the eastern flank of the mountain. Along the way I said hello to two men working on a hunting stand, drinking Keystone Light. I half-hoped they would offer me a beer. Monument Rock. Photo courtesy of Amanda Debevc. 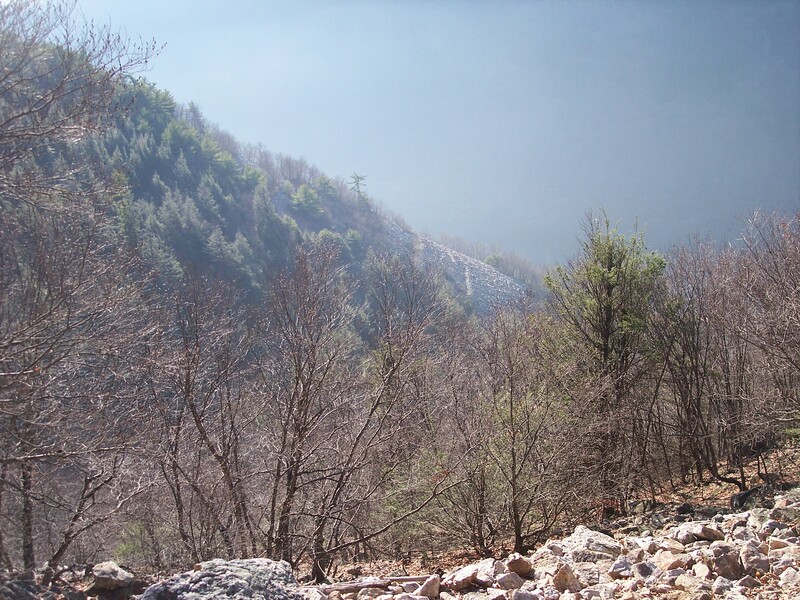 The trail became increasingly more rocky as it ascended to the top of the ridge. I was feeling sore and slow. It was getting darker as the trail passed talus slopes and a side trail to a view. It was too dark to see much of anything. Next was a wonderful trail through a pine forest to a trail register and another side trail to Monument Rock, a ten foot pillar at a vista. It was too dark for me to see it. Amanda and Kevin signed the register. It began to snow in earnest as a squall moved through the area. I worked my way into a glen with a small stream, my headlamp tunneling through the darkness. It was a beautiful place. Talus slopes rose all around, massive ledges towered through the trees, boulders littered the bottom of the mountain. I soon saw the headlamps of Kevin and Amanda. The snow was falling more heavily and it coated the ground. I set up my tent and gnawed on a piece of cold stromboli. The forest glistened white as a steady breeze blew through the forest. There wasn’t much point in hanging out. I crawled into my sleeping bag, rubbing my feet. My left shoulder ached. My hip bones were red. My body needed rest and I was slowly reaching my limit. We had hiked over 21 miles. We now had three consecutive days hiking over 21 miles. I saw lights in the valley below. I was a little jealous of those warm houses with beds, appliances, electricity and warm water. But I was also content to be where I was, experiencing this trail and all it had to offer. I would not get many opportunities like this. I slowly drifted off to sleep. It was about 7 pm. Tomorrow, the trail would bring me to its end. The faint morning light slowly illuminated my tent. I zipped it open and looked out. Light began to rise through the bare forests, as the sky above resembled, for a few moments, the dusk from the prior evening. The second day had begun. I got my things together and was on the trail first. I was feeling good. The trail made and increasingly steep climb up to the ridge of Jacks Mountain. At the top, the sun rose above the ridges to the east as heavy fog hung in the valleys below. A light breeze played with the leaves on the forest floor. I passed a log caked with congealed blood and tufts of fur. I looked at it for a split second. Nothing else remained. The trail reached Shorb’s Summit with its fine views to the west. 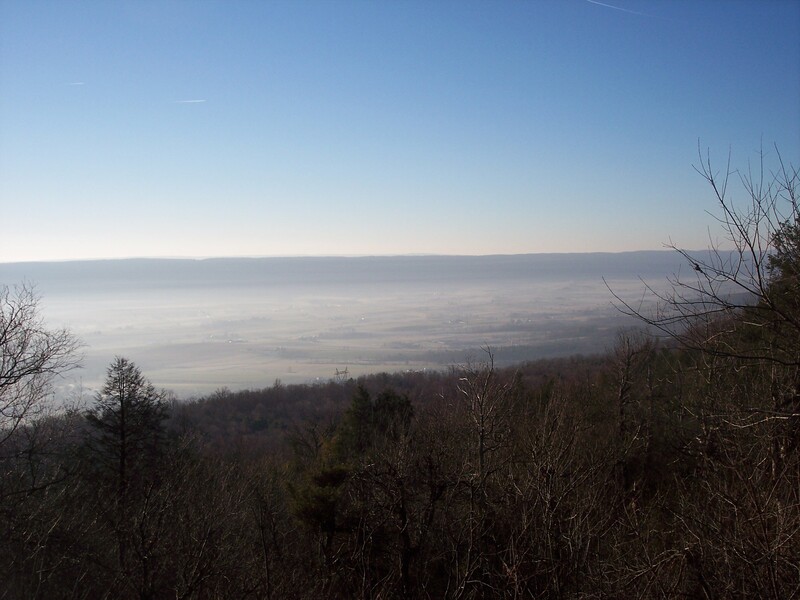 The Juniata River twisted within its deep valley, partially veiled by mist. The blue morning skies met growing clouds on the horizon. This would be a day of contrasts- blue skies to clouds, roads and towns to steep climbs and isolation, soft breezes to howling winds, the present to the remnants of our past. The trail descended to phenomenal Clark’s Vista. Both Kevin and Amanda were immediately impressed. Symmetrical ridges expanded like waves towards the horizon. The trail then followed a series of narrow switchbacks on old dinky railroad grades that were once used for quarries. In places, moss covered ties were embedded in the grade. We reached a flat area carved into the side of the mountain along the dinky grade. It was once used for the quarry operations. Cliffs and ledges towered over us. There were two men dayhiking up from the Thousand Steps. One man asked about our hike and the trail, his eyes widened with a desire to explore more of it. He was amazed we had hiked all the way from Greenwood Furnace. He said he wanted to hike it someday. There were more great views down into Mapleton as rock outrops capped the side of the mountain. Over a thousand feet below was the Juniata River as it flowed through Jacks Narrows, one of the deepest water gaps in the east. We soon reached the Dinky House where the trains were repaired. I took a picture into the vast chasm that is Jacks Narrows. We reached the famous Thousand Steps with its long staircases across talus slopes and forests of pine and hemlock. The steps were built for quarry workers a century ago so they could climb the mountain to work the quarry. 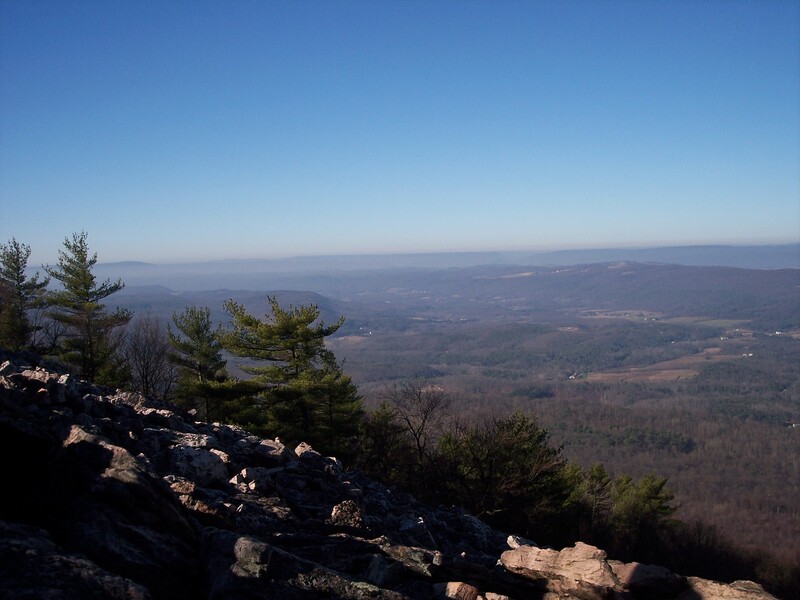 It is now one of the region’s most popular hiking destinations. In summer, there are thousands of little lizards along the steps. Today, there were several dayhikers, each striving with a personal challenge to climb the steps. We had the luxury of descending the steps, although our knees didn’t think so. At the bottom of the steps the trail followed a grade high above US 22. Rust colored cliffs rose hundreds of feet above us. We also passed a multi-colored outcrop that once reached the river, but had been cut back by the canal, railroads, and highway to its present location. We reached Mapleton as the skies began to cloud over and crossed over the beautiful Juniata River, its clear aquamarine water flowing over cobblestones. I’ve paddled much of this wonderful river with its stunning gorges, viaducts, and ancient canal walls, islands filled with birdlife, and water brimming with smallmouth and rock bass. This journey was different, instead of lush, temperate jungles along the river with herons and bald eagles, I would visit windswept vistas and rock-strewn ridges. Part of me wanted to go down the river, but the trail took me in a different direction. We crossed into Mapleton when I noticed an animal wandering around. It was small, dark colored, four-legged. It was a chihuahua running around town. It’s the first chihuahua I’ve seen on the loose, and the first that didn’t bark. I half thought it was feral. I laughed to myself with the thought of packs of wild chichuahuas roaming the woods, chasing hikers, creeping around tents, stealing food, speaking in a Spanish accent, talking about tacos. Mapleton was a nice town, but didn’t have a single restaurant. We did pass a mother trying to teach her teenage daughter how to parallel park. The trail then entered watershed lands and followed scenic Scrub Run. The run entered a shaded, narrow gorge through which a cold wind blew. Moss covered rocks and the stream banks. The gorge suddenly opened up into a beautiful wooded valley with aromatic pine trees and small, clear streams. This bucolic setting was the calm before the storm, for the trail went straight up the mountain. It was an unrelenting climb of over a thousand feet to the top of the ridge and Windy Vista. The vista lived up to its name. The clouds had moved in and shaded the endless ridges purple; scars of talus draped the mountains. A light drizzle sporadically blew through the air. The thought of reaching the shelter became even more enticing, but it was still miles away. The trail explored the wide, forested ridge. It wasn’t even that rocky. I could feel myself grow tired, my legs felt heavier. The trail descended to a pipeline, followed it, and crossed a small stream. A short, steep climb led to a series of dirt forest roads to cross private property. The trail returned to state forest land to begin another steep climb to the highest ridge and one of the trail’s highlights- Throne Room Vista. I pulled myself up the mountain, my poles scraping the rocks. The winds picked up. The winds swirled and contorted, heavy with the darkness of the late afternoon. I reached Throne Room, buffeted by winds as the ridges stretched into the distance, fading into a cool, autumn twilight. The diversity of terrain was breathtaking, from wide valleys to rugged water gaps. From here, I could see almost the entire distance I hiked. Winds raked the ridge, as the trees creaked and moaned. The speeding clouds seemed so close. At the western horizon, the clouds began to break and sunlight filtered through. I knew light was fading fast. 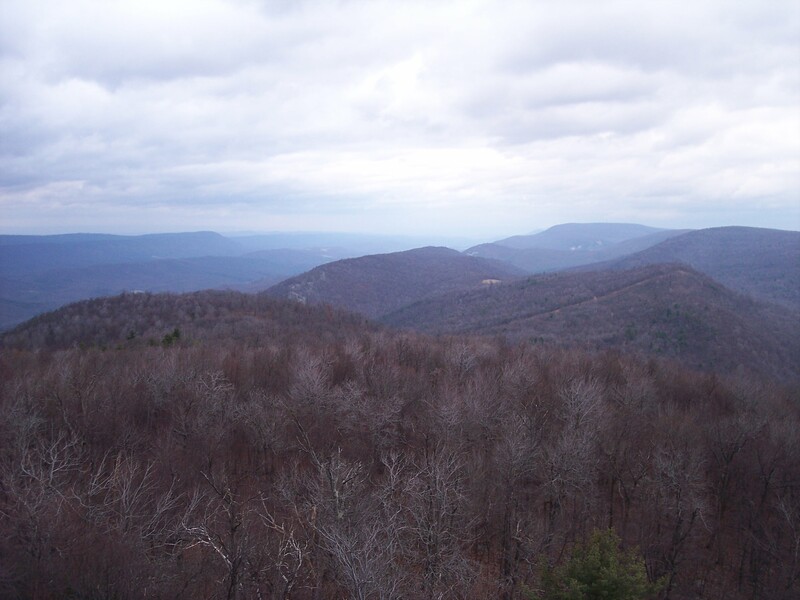 I continued along the ridge with views in all directions, and carefully crossed Hall of the Mountain King, a saddle between the ridges covered with boulders. New trail was contructed to Butler Knob as it explored thickets of laurel. As I reached the knob, I was treated to an amazing sunset, the last light of the day. Butler Knob offers an amazing view to the south, but it was masked in twilight. The lights of Orbisonia twinkled in the valley below. 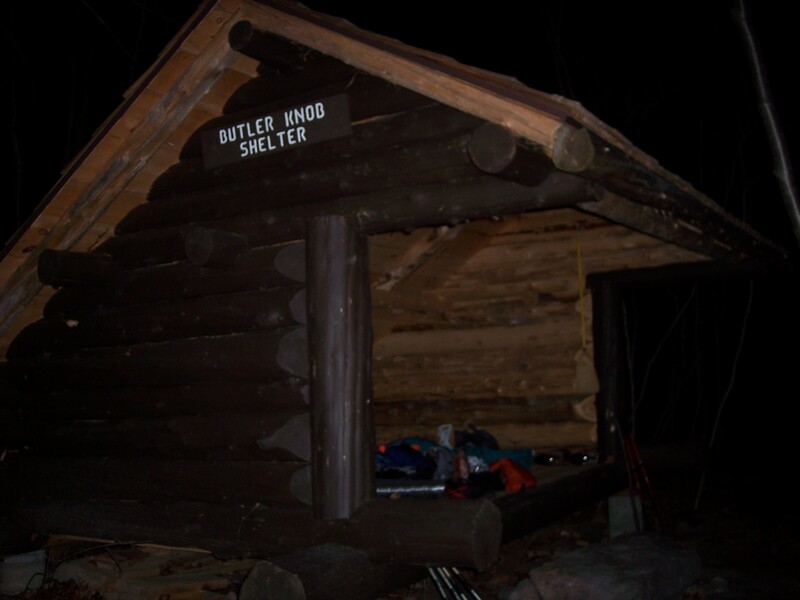 The trail switchbacked off the ridge and reached the new Butler Knob Shelter, embedded in a birch forest. It was dark and Kevin and Amanda had a fire going. It was a beautiful shelter, featuring cut firewood, a fire ring, picnic table, even toilet paper. It was nice to be in the comfort and safety of the shelter. We ate our food as the winds whipped the trees. I crawled my sore, aching body into my sleeping bag to get some sleep. We hiked about 22 miles today over the biggest climbs and descents of the trail. My body begged for rest, my muscles seared with exhaustion. We all tried to sleep as fierce winds roared along the ridge. We were over half-way, but the end still seemed so far away. The trail wasn’t done with me yet. This Thanksgiving weekend I decided to hike a trail that would offer new experiences and challenges, while also returning me to past chapters of my life. I decided to thru-hike the Standing Stone Trail. Over ten years ago, I lived in Lewistown. I was new to the area and learned of a trail some volunteers were trying to re-open after nearly being abandoned. At that time, it was known as the Link Trail. I decided to help out. I joined the club, helped maintain the trail, and even incorporated the club. While I lived in Lewistown, I hiked several sections of the trail. I was amazed by its vistas, geological features, and historical remnants. I was on this trail after the 9/11 terror attacks. I drove up Allensville Road that evening to hike a short section of the trail to clear my mind. I passed a man who was tracking raptors at Hawk Watch; I asked him about the tragic news of the day. He looked at me with a blank stare- he hadn’t heard. He walked away dumbfounded. I almost felt guilty for telling him. I reached Sausser’s Stonepile under crystal clear skies as the sun began to set, casting the mountain ridges in a golden glow. It was breathtaking. But what I remember most was what was not there- not a single plane was in the sky. There was complete silence as the daylight faded away to a cool, somber evening. I knew the trail had the potential to not only be one of the best in Pennsylvania, but also the mid-atlantic. But I would not be there to see it through. I moved from the area, keeping tabs on the trail from a distance. The trail was re-named the Standing Stone Trail (SST) and a concerted effort began to truly remake the trail with new routes and additional features. The work volunteers have contributed to dig new sidehill, move rocks, create steps, water bars, cribbing, and a shelter is nothing short of impressive. Along the way, a trail is gradually being reborn. 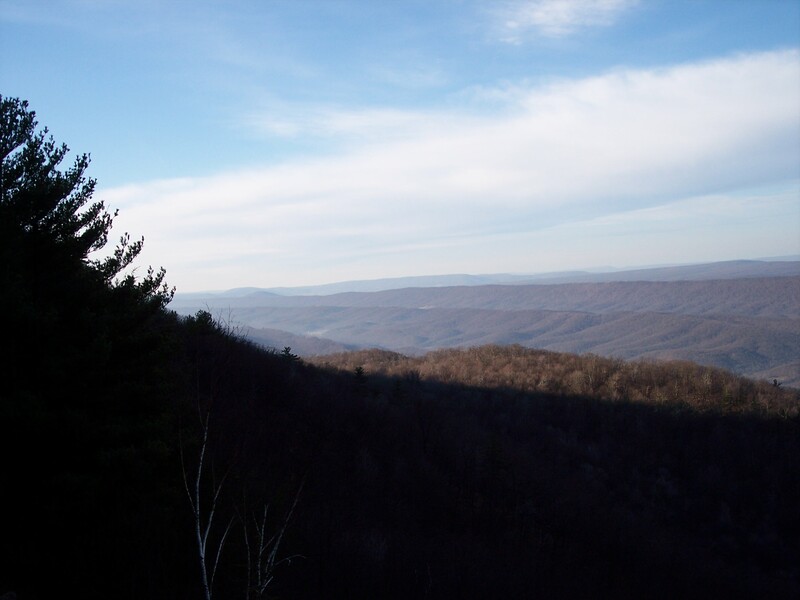 The SST used to exist in the shadows of Pennsylvania’s better known backpacking trails. That is beginning to change. The unique features of this trail can no longer be ignored. It does not simply link vistas or streams in the isolation of a state forest, rather the SST links two state parks and towns. It introduces you to communities, farms, and bucolic countrysides where people live and work. It transports you along a corridor with remnants of how people used to live their lives in relation to the land. 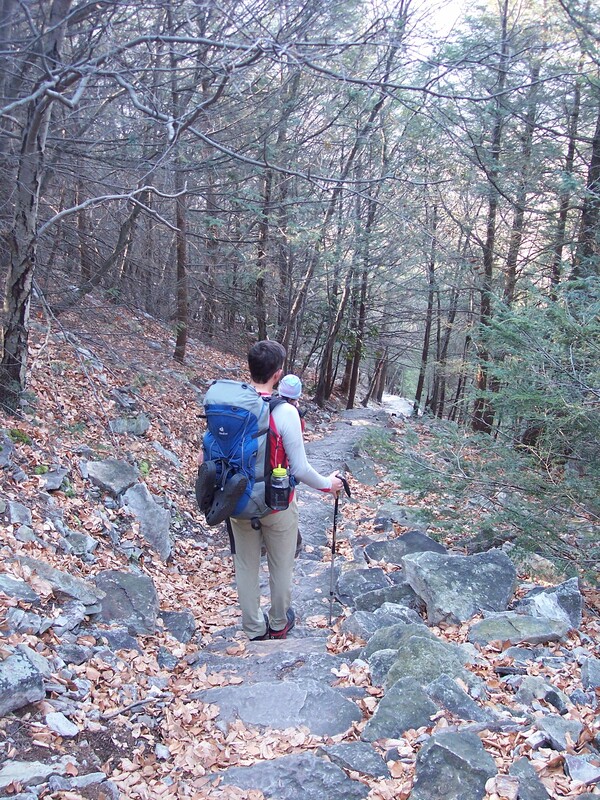 It offers a backpacking experience so different in Pennsylvania. As the trail improves, it will take its place as one of the state’s finest. So on a chilly Wednesday night I met Amanda and Kevin in Cowans Gap State Park. The stars glistened across the sky. We shuttled our car north to Greenwood Furnace State Park. In over an hour we drove a distance that would take us four days to backpack- a distance that would be 79 miles. We reached Greenwood Furnace, once home to an iron smelting community. We began hiking on the trail at about midnight. After a half mile in, we found a clearing and set up camp. The night was clear, so I thought there was no need to set up my tent. I laid my sleeping bag under a pine tree and fell to sleep wondering what the future miles would bring, wondering what challenges would have to be overcome, and what experiences would make it all worthwhile. I fell asleep as shooting stars streaked overhead. We woke the next morning to frost. I was protected under the pine tree. The sun began to rise over the eastern ridge, promising a beautiful day. I began the hike ascending the ridge under hemlocks. The sun finally rose above the ridge, illuminating the forest from the side. I reached stunning Stone Valley Vista as the shadow of the mountain I was on stretched across the valley and farms. The SST follows the ridge of Stone Mountain. The terrain became increasingly more rocky, but the views were impressive. The trail crossed one ledge that looked down into Big Valley, draped in mist. The ridges seem to float above the clouds under a deep blue sky. The SST traverses an area with a large Amish population. Kevin and Amanda told me they spoke to some Amish hunters on the trail. While most people could not relate to what we were doing, I had the feeling the Amish could. For a long weekend, we were in their world. 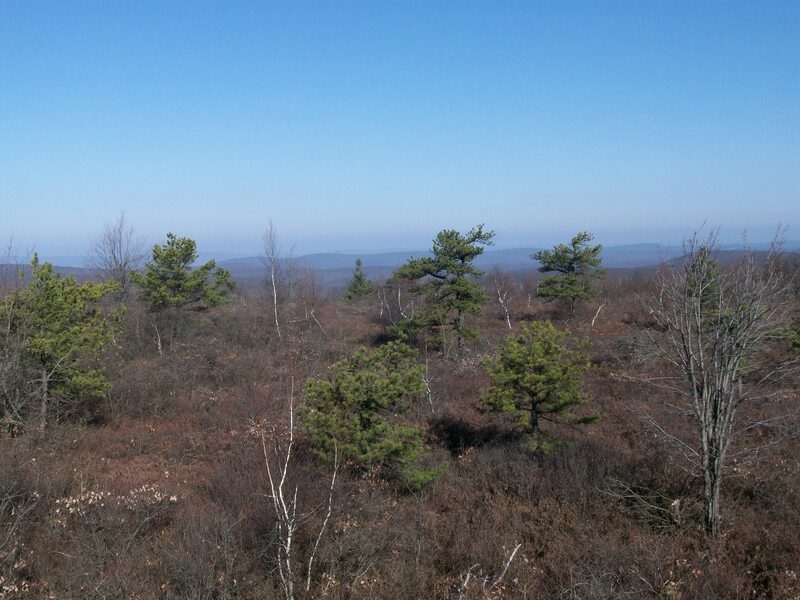 The ridge revealed more views- Little Vista, Sausser’s Stonepile, Hawk Watch. 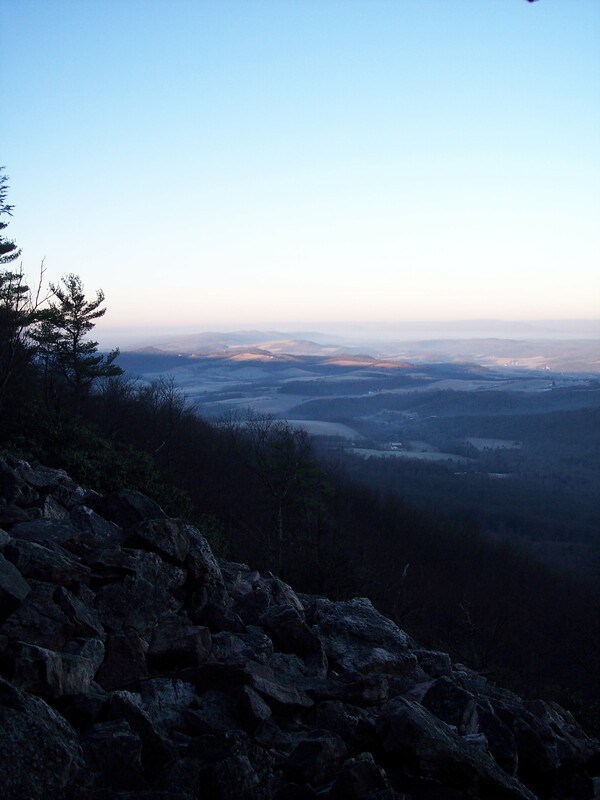 Each revealed the beauty of central Pennsylvania. The viewing platform at Hawk Watch had the following advice written on it: “Consume Life”. We reached Allensville Road, which had a new kiosk. A descent to Rocky Ridge followed. We passed another Amish hunter and a designated camping area. 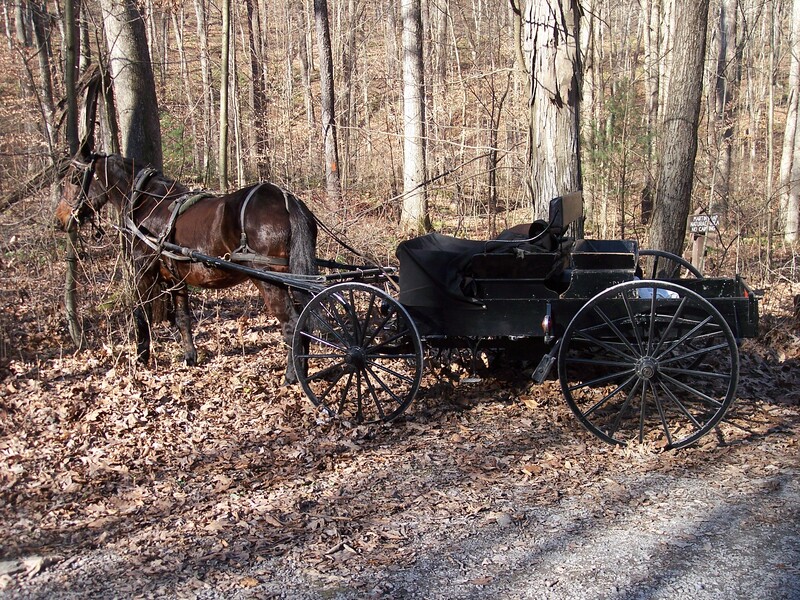 At Frew Road, we snapped pictures of the Amish hunter’s buggy and horse. The horse snorted with mild annoyance at our curiousity. The Amish hunter’s horse and buggy on Frew Rd. 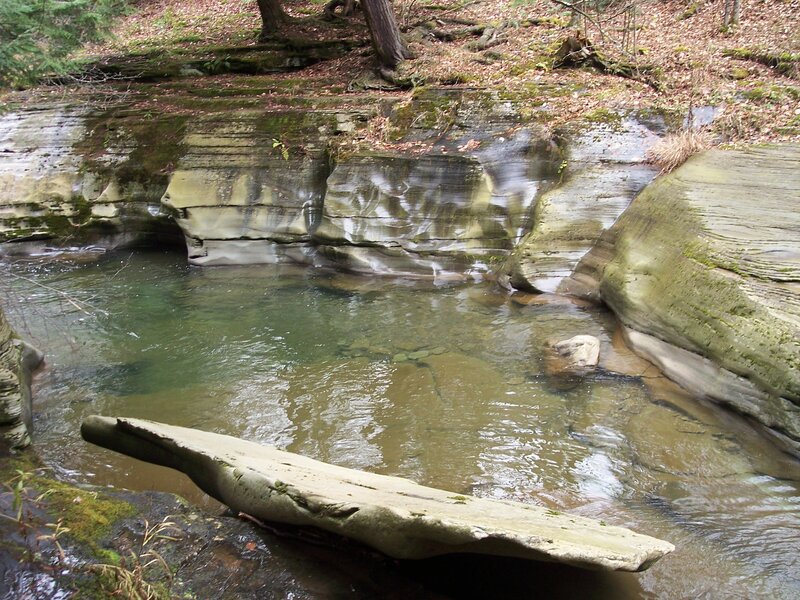 Rocky Ridge is home to Oriskany Sandstone formations that are home to rare wildflowers. In spring, the ridge teems with flowers and dogwood floral displays. It is a special place. The SST follows a new route as it meandered between the rock formations, under pine and through laurel, with views to the west. It was a stunning section of trail that took an incredible amount of work to construct. The formations were non-stop under the bright sun. At times, it was hard to see the blazes due to the bright sun. I’ve been blinded by the sun while driving, but not hiking. 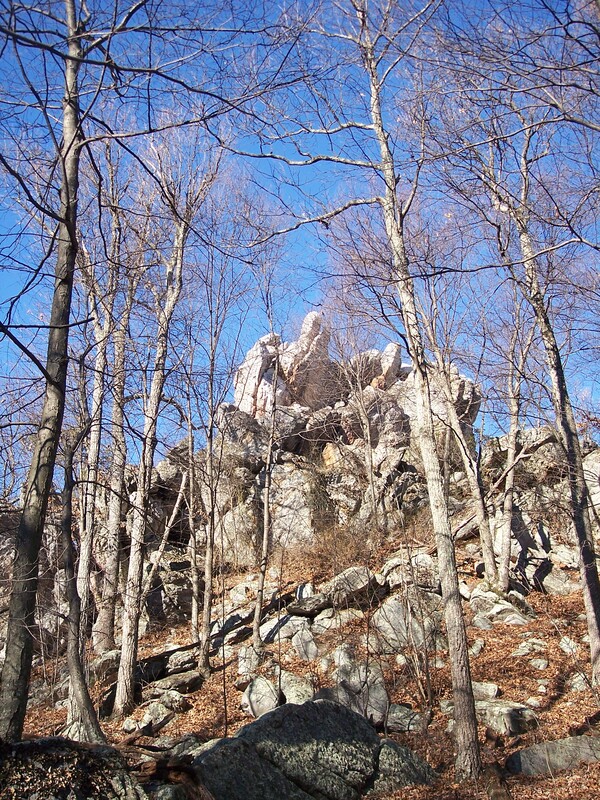 A yellow side trail led to the impressive Hunter’s Rock formation. The trail descended to a creek. One unique feature along the SST is its karst geology. This creek disappeared under the ground and sinkholes dotted the forest floor. The bedrock was limestone and we probably hiked on the top of caves. More impressive sandstone formations continued along the ridge, with one that looked like fingers jutting above the trees. Further down the trail were old charcoal mounds that were used to make iron centuries ago. I soon faced my first challenge. I was feeling great, but my left thigh began to cramp, and then my right thigh. I couldn’t figure out why. I then realized I was dehydrated. I had not been drinking enough water over the course of the bright, sunny day. For the rest of the day, I had to be careful since I felt the cramping could return. I began to hike at a slower pace. 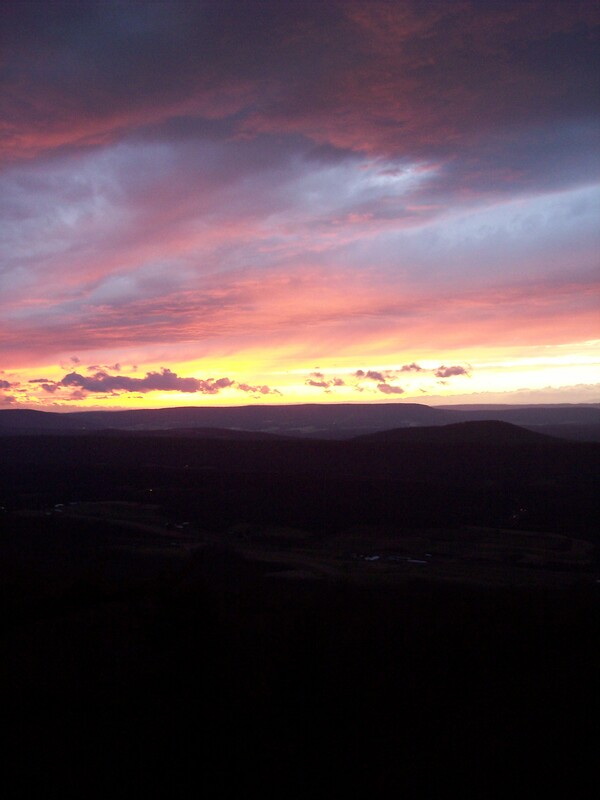 I descended to Saddler Creek and PA 655 as the sun set. New switchbacks led down to the road. I hiked through the hamlet of Fousetown; a small child was riding his bike with some adults nearby. I waved, and they waved back. The trail passes behind a house and climbs along a field. Jets streaked across the clear, metallic skies. Next was the infamously steep climb up The Hump. The gradient eased as the trail passed a small camper and followed a grade under dark hemlocks. To the left was a deep, rugged gorge with the sound of cascading water. I was hiking in the dark, with only the shaft of light from my headlamp. I saw Kevin and Amanda filtering water at a small stream. We camped in a clearing a short distance off of the trail. The climb up to Shorb’s Summit would wait for us in the morning. As we set up camp, a coyote howled in the distance. We then began to hear things in the trees. What was it? A squirrel? Raccoon? Spider monkey? Our headlamps failed to resolve the mystery. Amanda then realized it was large oak leaves hitting each other as they drifted down. We hiked almost 23 miles, the story of the remaining miles would have to unfold with each step. Standing Stone Trail’s website, including maps. This past weekend I returned to the Pinchot Trail for a quick overnight. My friend Ashley and her boyfriend Matt wanted to give backpacking a try, so I suggested we do the south loop of the Pinchot, an easy trail known for its diversity. 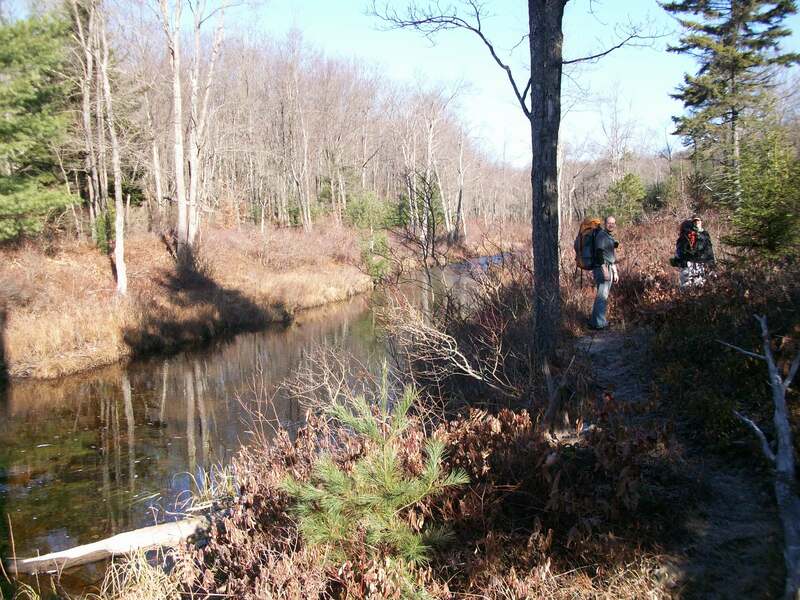 The Pinchot is described as hike no. 2 in Backpacking Pennsylvania. We met at the main trailhead under cool, crisp skies as the sun shone through azure skies. Not a cloud was in the sky. The forests softly dripped with melting frost from the morning. After a quick visit to Big Pine Hill’s expansive views, we were soon on the trail as it parsed rhododendron jungles and crossed a meadow with a forest of spruce in the distance. We hiked over a ridge with meadows and descended along wetlands and small streams. Forests alternated from rhododendron to laurel, hardwoods to pine plantations. Soon we reached Butler Run where we went on a side hike to beautiful Choke Creek Falls, a double cascade that surged into a deep, dark pool. We enjoyed this beautiful place, now a part of the Lackawanna State Forest, as the sun began to set. We continued on the trail, which gradually descended back to Choke Creek into a forest of spruce. Here we found our campsite for the night, and it was a fine one. Our site was on a ledge overlooking a swirling pool on the creek. Deep green spruce and hemlock trees guarded our site. We set up our tents in the fading light, enjoying the beauty. On this trip I brought my tarp, which is lighter and easier to set up. On the other hand, tarps provide no insulation and are more exposed. It was a chilly night, well below freezing, but I stayed fairly warm in my sleeping bag after a few adjustments. An owl hooted in the distance. Morning came too soon as sunlight erupted from the thick spruce forest. A layer of frost covered almost everything, including my sleeping bag where I exhaled. We slowly got around, getting our stuff together, trying to fend off the cold. The sun rose in the sky and warmed this frosted world. We were soon back on the trail, hiking along beautiful Choke Creek, passing meadows and spruce forests. The trail left Choke Creek and gradually climbed into a beautiful forest of hemlock, spruce, and rhododendron jungles. The forest was so green, it was hard to believe it was still November. The trail was carpeted with moss as laurel and teaberry grew nearby. As we hiked the road back to the cars, two men were picking up wood from some trees that were cut. One man, who was sitting, questioned us with an exclamation, “You didn’t sleep in the woods last night?” We ackowledged it was chilly, but we survived. Ashley and Matt enjoyed the trail, finding it perfect for beginners. They appreciated the diversity along the trail and a chance to enjoy the woods for a night. The Mid State Trail is the longest in Pennsylvania, stretching from Maryland to New York. 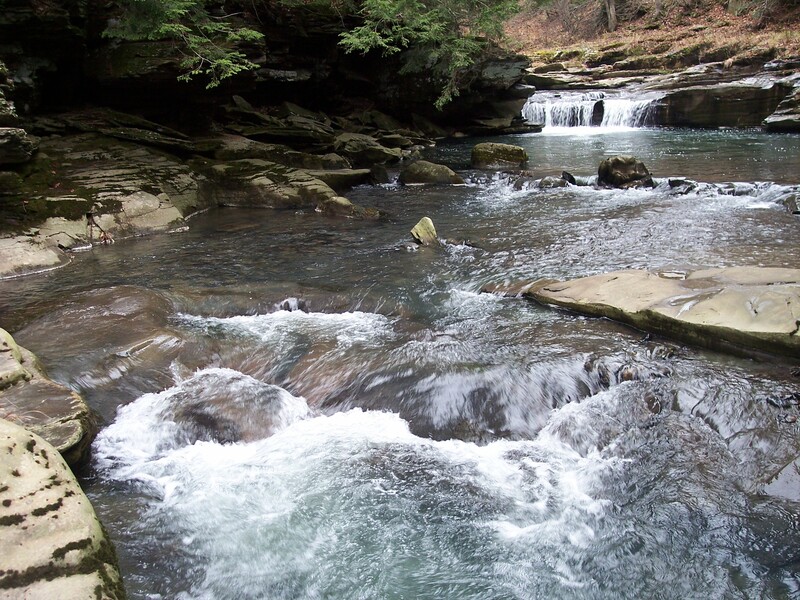 In the Tioga State Forest, the trail climbs out of the Pine Creek Gorge and descends along Mossy Run to Stony Fork, a stream of great beauty that is famous for its cascades, deep swimming holes, and polished bedrock. 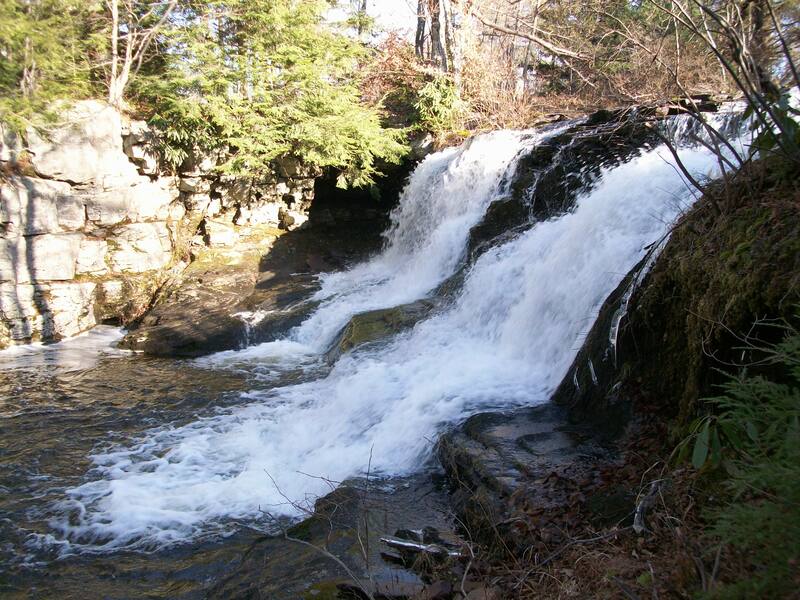 It is beloved by hikers, whitewater paddlers, anglers, and nature lovers. I maintain a section of the trail along Stony Fork. Recently, I drove out to the trail to work on my section. 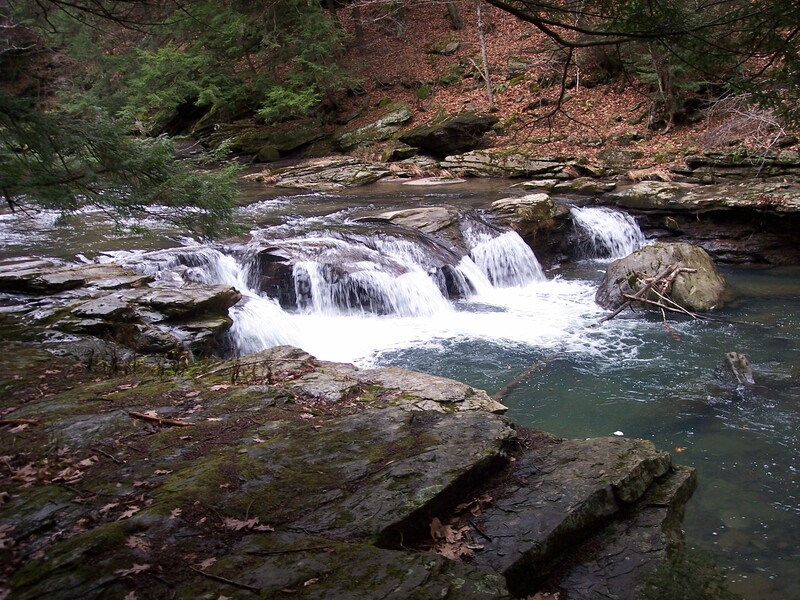 From Claymine Road, the trail meandered between large rocks and descended along Mossy Run, a small stream with many waterfalls and cascades with ledges and rocks that are often carpeted with moss. The stream is odd; it often flows underground, only to reappear to tumble over a bedrock ledge. The trail then follows Stony Fork with its rapids and deep clear pools carved into the smooth bedrock. The trail stays close to the creek, only leaving to climb higher above when the terrain along the creek becomes too steep. The roar of the creek was a constant companion along the trail as it twisted and turned through laurel and under pine or hemlock trees. As I headed downstream, the creek became more impressive, with larger cascades, slides, and deeper pools surrounded by ledges dripping with springs. The sun fought through the clouds as the winds picked up from an approaching cold front. Leaves danced across the forest floor and over the aquamarine water. If you ever hike the Mid State Trail, take time to enjoy the beauty of Stony Fork. 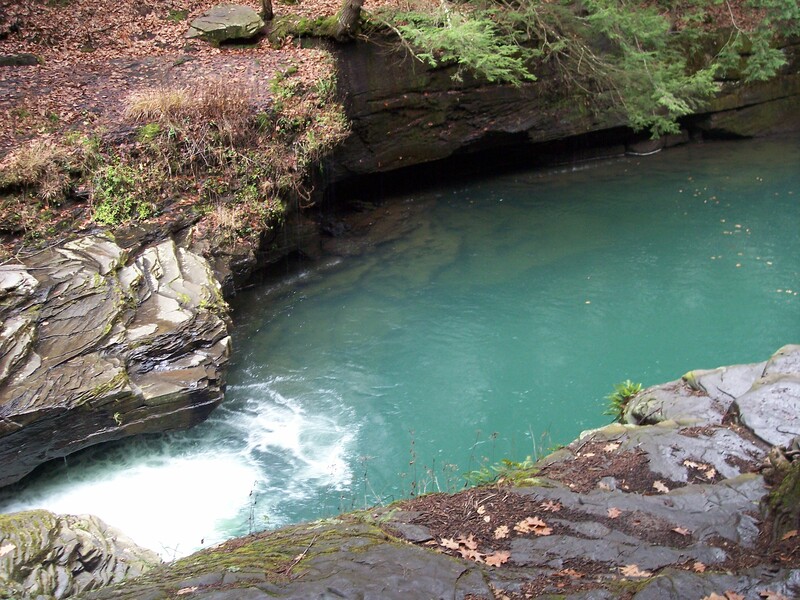 In the summer, you’d be hard pressed to find better swimming holes- a nice treat for summer backpacking. Keep in mind that a bridge does not exist where the trail crosses the creek, so be prepared for wet feet and do not attempt to cross in high water as Stony Fork becomes a powerful and dangerous whitewater river. Surrounded by State Game Lands 316, beautiful Cobey Pond is one of the best-kept secrets in the Poconos. The pond covers about fifty acres or so and features several small islands and a rocky western shore that offers nice views over the water. We arrove at the parking area fairly late as the setting sun dipped between the bare trees. We followed a gated, grassy road as it gradually meandered uphill. We ended up taking the long way to the north end of the lake; the best route is to take the first grassy grade to the right after the parking area gate. This will take you to the outlet of the pond. A trail also circles the pond. All the trails are easy, but are unblazed. 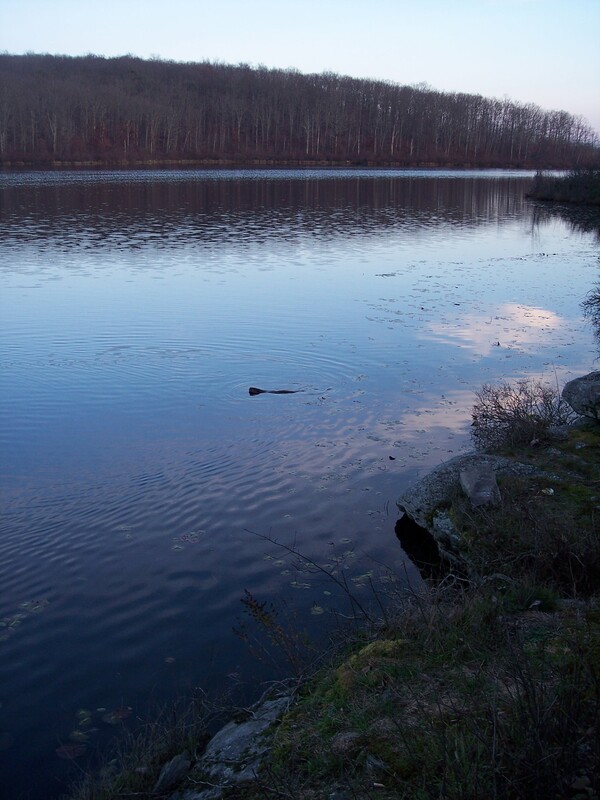 As we hiked along the shore, a beaver approached us as it swam across the water, leaving a wake on the still surface. The beaver got closer and closer before veering to the right. 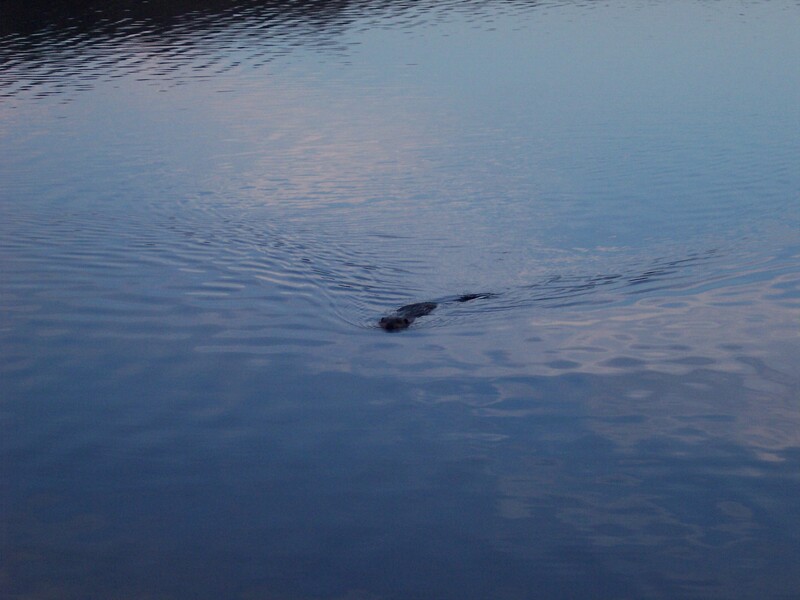 I saw the beaver again, but was a little too close as it smacked the water with its tail and dove under the water. The beaver was soon back, scoping the shore. We soon saw what it was after, several freshly chewed birch logs and branches. 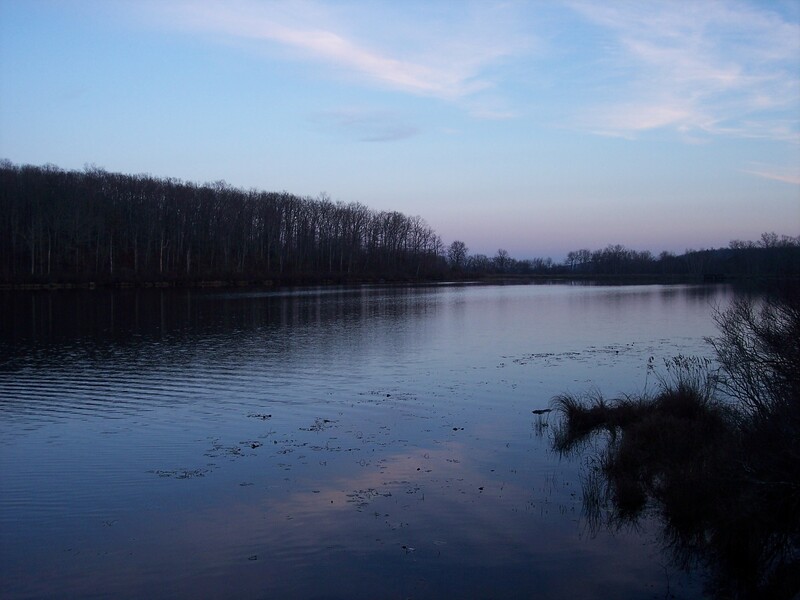 The smooth waters reflected the forests and pastel sky perfectly as the sun disappeared. Twilight crept over the lake as bats swooped overhead. Cobey Pond is not without its colorful history. It was once owned by a prominent cocaine drug runner who would pilot planes down to Colombia to pick up cocaine for sale in the United States. The drug runner was eventually apprehended and his property was forfeited to become what are now state game lands. Not only is Cobey Pond an ideal hiking destination, but is also perfect for paddling, although you would have to carry your boat in from the parking area. Before we left, I saw the phrase “Begin the Dream” carved into wood on the dock. Cobey Pond is just the place to give you that motivation. We walked back to the car as light receded from the skies, thankful for seeing another hidden gem and planning my return during the deep green of summer or the blazing foliage of autumn.